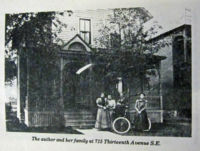 The house at 715 13th Avenue South in the Marcy-Holmes neighborhood in Minneapolis was the second home that Joseph Hunt Hiscock and Kate Dagget Hiscock lived in and the first house they had built for themselves and their family, in the 1880s before building permits were required. Joseph was a furniture maker and manufacturer. Kate was a talented musician and had a gift for learning languages. Her daughters Jennie Isabel and Harriette inherited these gifts. In May of 1896 when Jennie was about to graduate from the Marcy Elementary School, she was one of several hundred school children who helped pull the historic Stevens house from Minneapolis to Minnehaha Park. Jennie graduated from Minneapolis East High School in 1900. She graduated from University of Minnesota in 1905, with a major in French. She received her M.A. in French from Middlebury French College, Vermont. Her first teaching contract was signed in 1905 to teach music and German at Sherburne High School, a rural location in southern Minnesota. After this, she taught French and German at Norwood (Massachusetts) High School. In the fall of 1908 she received an offer to teach French and German at the newly opened Minneapolis West High School. She taught languages there for 41 years until retiring in 1949. From her first trip to Europe in 1907, the urge to travel continued. She traveled again to Europe in 1923, and then in 1925. Her father traveled to Europe with her in 1930. Her sixth and final trip across the ocean in 1966 was made by airplane to visit the daughter she had adopted at the beginning of WW II through the Save the Children organization. Jennie had a musical heritage. Her mother was one of the first pianist-organists in Minneapolis. Her sister was an opera singer. Jennie began attending Minnesota orchestra concerts in 1903 when the orchestra was founded as the Minneapolis Symphony. In 1974 the orchestra honored her long loyalty when it moved into a new facility, and presented her with a pair of season tickets to the Young Artists concert series. She continued to attend concerts every year until she was well over 100. When Jennie turned 100 years old, a proclamation by Mayor Fraser of Minneapolis declared June 9, 1981 as "Jennie Hiscock Day." There were many celebrations and well-wishes for the special day. For all of her 106 years, Jennie retained her love of languages, music and the southeast Minneapolis neighborhood, where she lived most of her life at 715 13th Avenue SE. She published two books with memoirs of her life and career. Even as a centurion, she tutored a woman in French once a week and went out to lunch "at the drop of a hat" when someone called. She was an active member of the Minneapolis Woman's Club, First Congregational Church in southeast Minneapolis, Alliance Francaise, Daughters of the American Revolution, Daughters of 1812, Minnesota Historical Society, and the Minneapolis Institute of Art. According to her sister Jennie, Harriette was born to be a prima donna. She had everything: a clear, sweet soprano voice, even features, a fine figure, white neck and shoulders, a kind and attractive personality. People recognized her talent, and Harriette began singing at a young age. She took piano and voice lessons from her mother. She gave many recitals and gave programs on winter trips with her Aunt Hattie. She was an accomplished pianist so her programs contained piano and vocal selections. At the urging of her mother, Harriette took lessons to prepare her for opera. When a new musician arrived in Minneapolis, Minnesota, Fraulein Anna E. Schoen Renee, Harriette took voice lessons from her. Those lessons developed Harriette's voice and prepared her for opera. She left for New York in the summer of 1905. She joined a booking bureau and then eventually joined the Herald Square Opera Company. Later she joined the Royal Company. She sang the Princess in the Mascot, the Queen in Said Pasha, Yum Yum in the Mikado, and other roles. In 1912, she sang in Jack and the Beanstalk in Dedham, Massachusetts. A successful career was assured. In the winter of 1912, Harriette had a six week engagement in Dallas, Texas. Newspaper articles gave her high praise, and it was her most successful engagement. After the Dallas event, she went home to Minneapolis for a short visit before returning to New York to prepare for the summer season. Given her mother's failing health, she felt needed at home, and stayed longer. During this visit to Minneapolis, she received medical attention for a small growth in her nose which was interfering with holding her breath when singing. A doctor in St. Paul performed an operation, and she remained overnight in the hospital because a March blizzard made travel difficult. In the morning, the nurse had made a mistake; she had brought formaldehyde, which, burned Harriet's sinuses, mouth and throat badly. She was never herself again. On the morning of Memorial Day, she was sick. She ached in her extremities, a sign of blood poison. The family took her to the hospital where she died in June. She was 37.